A project to test out the latest technology in cancer pathology is under way across Greater Manchester. Vanguard Innovation is exploring the use of digital pathology that can capture a digital image of human tissue samples. Also known as on-screen microscopy, the technique allows samples to be shared quickly among specialists and so has the potential to reduce the time it takes to reach a final diagnosis when second opinions are required. 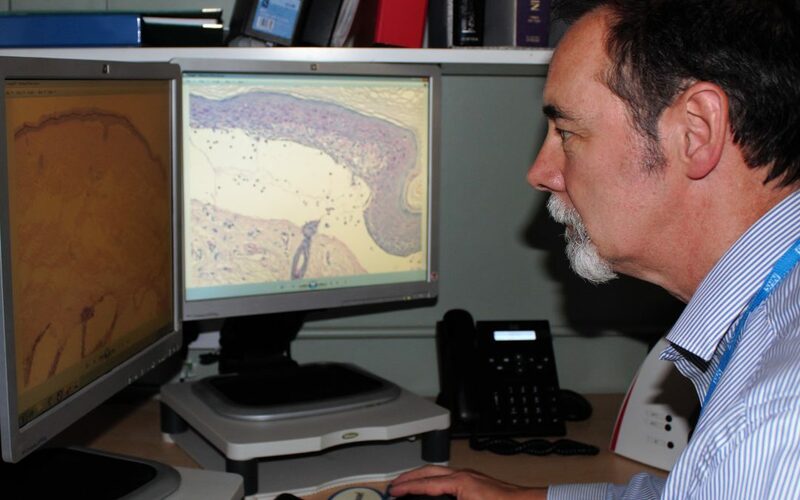 Histopathology is the medical speciality that microscopically examines human tissue to help reach a diagnosis. Currently, that tissue is analysed using a microscope and glass slides, on which the tissue is mounted. When second opinions are required the glass slides must be physically transported to other specialists who may work at another location. The logistics of transporting cases that require second opinions can cause delays and limits access to and the development of subspecialist histopathology services. The Vanguard Innovation project aims to secure the support of histopathologists for the latest technology. The project will cover all seven trusts that provide pathology services in Greater Manchester and will test out the potential for a cellular digital pathology network for the whole city region. Dr Luisa Motta is a consultant dermatopathologist at Salford Royal NHS Foundation Trust and Vanguard Innovation’s clinical lead for the digital pathology project. She said histopathology is crucial for the diagnosis of many cancer and non-cancer patients. ‘Histopathology is not only important to establish the right diagnosis but also helps to understand prognosis and to decide on treatment options. ‘What we do affects individual patients, families, communities, public health planning and the overall NHS finances. Histopathology departments in the country are struggling and our patients are affected. It is essential to look for innovative and sustainable ways of improving the delivery of histopathology. She added that a significant amount of consultation had already taken place with pathologists and other stakeholders to pave the way for this project. ‘We want to find out how our colleagues working in cellular pathology feel about working with the new technology, which has the potential to bring significant benefits to patients,’ said Dr Motta. The three-month pilot scheme will compare the results of cases using digital pathology with the same cases using conventional pathology.